Bright BeerTanks are also referred to as maturing tanks and are also made of SS 304 or SS 316 as desired. 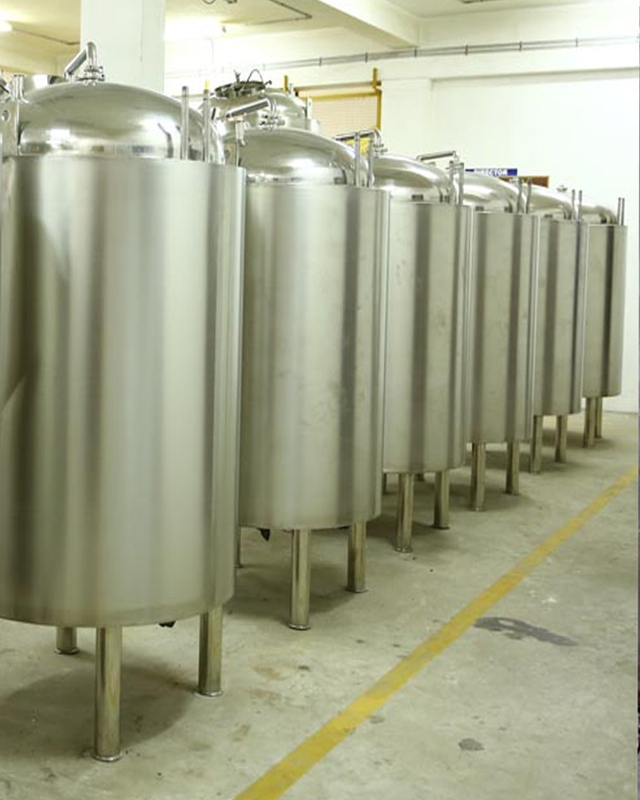 These tanks are designed with a dish bottom and is equipped with dimple jacketed glycol cooling system and insulated with 50-60 mm poly urethane foam. Tanks are fitted with high quality solenoid valves that regulate tank temperature. The cooling surface includes the cone and the bottom dish area. All tanks are fitted with high quality RTD sensors for accurate temperature indications and pressure gauges. Tanks are pressure tested to 3.0 bar and are fitted with a safety pressure valve set at 2.5 bar. Single or dual CIP spay balls are fitted for CIP operation. Overhead cross arm extending to the side is provided with a pressure regulating device. Arrangements for applying counter pressure of Carbon Dioxide is provided in the cross arm assembly. Tanks are equipped with sampling outlets, beer python line outlet and inlets for carbonation. Optionally flow meters, beer level tubing and kegging outlets can be provided. Tanks are available from 200 liters to 2000 liters in the microbrewery range, and larger capacities for full scale brewery. At PRODEB we know that your bright beer tank is the last vessel that your beer comes in contact with to become a beer that is perfectly matured, clarified and ready to be packaged and served. We at PRODEB ensure the proper cooling and final development of your beer by placing glycol jackets at specific locations on the shell to maximize cooling efficiency. The spacing between our jackets is 130% thicker than that of our competitors who use inflated jackets. This ensures that efficiencies are maximized and time needed to cool your product is minimized. Whether your bright beer tank is used to further mature, store or serve your beer,we ensure that every element is perfected to represent the attention to detail that our clients also put into their product.